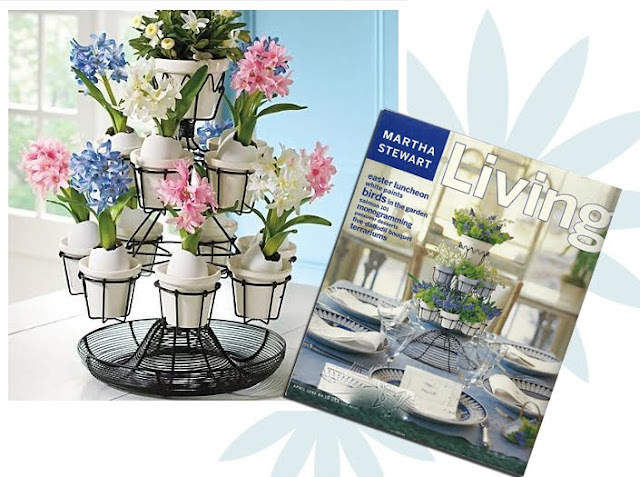 Spring is one month away, and we have two more months before Easter Sunday arrives on April 24th, but the busy bees at Martha Stewart Living have already rolled out their Easter collection at Grandin Road. And quite a collection it is - a fairly extensive line of table accessories and decorations to help make Easter a little extra special. What I love about the line is the synergy behind so many of the product ideas: many of the decorations have been seen as DIY projects in the pages of Martha Stewart Living magazine over the years. Below are some of my picks from the collection, which can be viewed in its entirety by clicking here. This pretty wire planter was influenced by a similar one that was featured on the cover of the April, 1998, issue of Martha Stewart Living. The designers revised it slightly, but it's still the same charming size and style, perfect as a centerpiece. 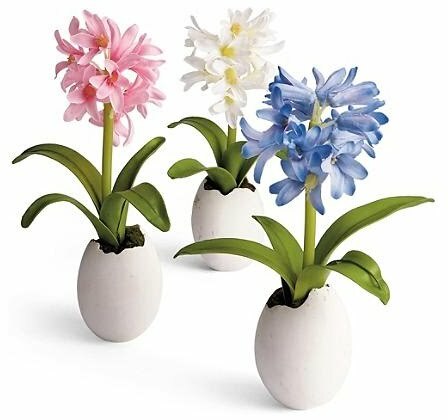 To place inside the planter, Martha's designers came up with a charming option: hyacinth flowers blossoming from egg shells! 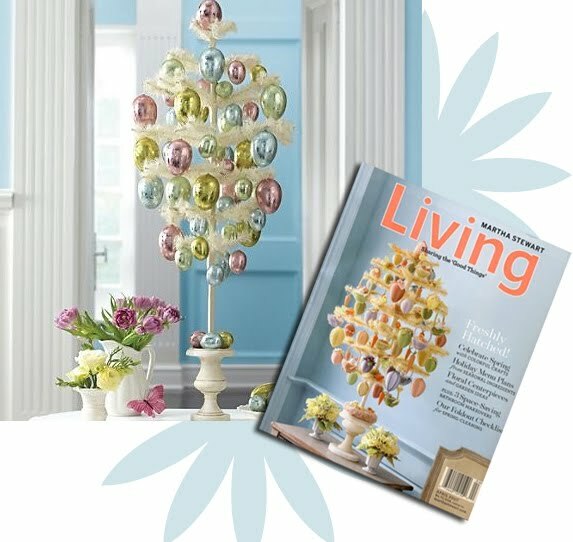 Here's another piece influenced by a DIY craft that took the cover of the April, 2007, issue of the magazine: a feather tree adorned with beautiful hanging egg ornaments. 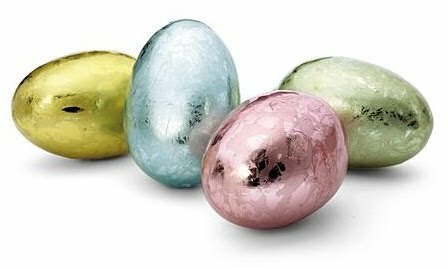 The ones on the cover are homemade, of course, but these lovely metallic eggs (below) would be just as beautiful, catching the daylight (or candle light) on an entry table or dining room sideboard. 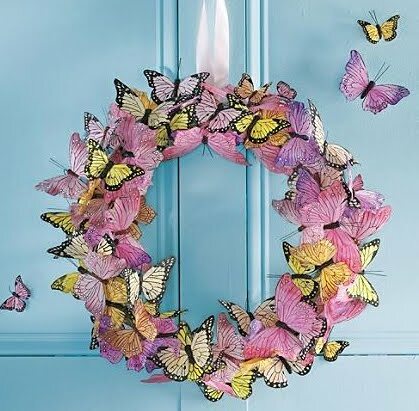 A flurry of butterflies in bold pinks, yellows and oranges herald the arrival of spring when they're amassed in a wreath formation. Below is a closeup of the design. I love the new Easter/spring items through Grandin Road. It's quite scary Andrew.. we did the same thing.. looking at the covers from Living that appear to be the inspiration for the new line. It's nice to see some things come to life from the magazine. Reminds me of the 'ol Martha by Mail days! Hate to say it, but I don't think the Grandin Road products are always up to Martha's standards. I had always been so impressed with her Martha by Mail products, but I ordered the Easter tree, and it arrived broken. Twice. The box in which the tree was shipped was not sturdy at all, and the product is inferior. I hope that Martha Stewart's people can work with Grandin Road to improve the product line. Does anyone know if there is some kind of Martha by Mail archive of all the catalogs online somewhere? I like through the lattice lang Dan lk new Easter/spring project. I have been very impressed, her Martha mailing products, but I ordered in Easter trees, it arrived in broken. Twice. In it, no strong tree package inferior products.